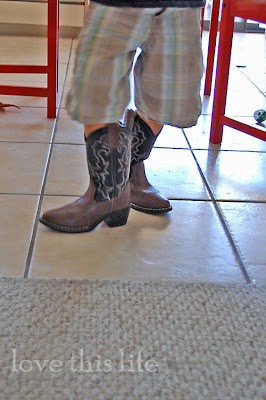 I just found Asher determined and digging through the costume trunk with a pair of cow boots already on the wrong feet. He was searching for the missing partner to the dazzling Dorothy shoe that he so adamantly was wanting Journey to wear. I asked what he was up to. "We are putting on our pretty shoes and we are going...DANCING!" The perfect dancing music for this moment? The mood most surely called for a "Love Revolution". Now...go put on your pretty shoes and dance! i am sitting here laughing out loud.....oh i wish i was there with some pretty cool shoes of my own...to join this party! love it! 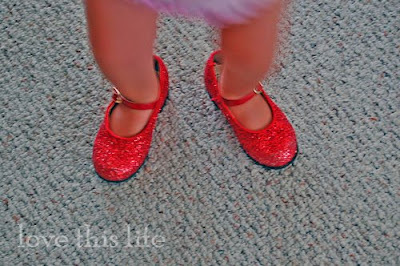 i'm so totally in love with those dorothy shoes!!! i hope you and yours have a most fabulous weekend. I love the pictures, I can remember when my nephew now 25 was little he put on his boots on the wrong feet, and would not change them, so we let him be!boots on the wrong feet look so funny and they walk so funny as well, and I simpley love the Dorothy shoes, she looks like she wants to tango and him...the 2 step, I just LOVE how kids think, so....did they dance the night away? I love it! i'll see if i can scrounge up some dancin' shoes...sure wish i was two steppin or doing the tango with those two love bugs! i miss you guys!